As the use of social media and the internet continues to rise, it is important for your business to stay up to date. You need to know which social media platforms will help your business the most in the long run. Facebook and LinkedIn are popular social networking websites. The profiles in Facebook are created for the purpose of connecting to friends and family to keep in touch. LinkedIn is more business-oriented, and mainly for professional networking. 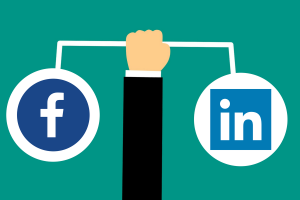 People tend to use LinkedIn and Facebook for two very different reasons. Facebook is a social network, meant for sharing and engaging in conversations, likened to hanging out with your friends and family. LinkedIn was originally established primarily for job recruiters and job seekers to connect. It has since evolved far beyond that, however, LinkedIn is still focused in the business realm. LinkedIn users tend to be white-collar college graduates, making the LinkedIn environment appealing to the business user. Link Ads – Drive audiences to specific pages of your site to help build the traffic to your website. Ad formats of this nature include video ads and carousel ads. Lead Ads – Gated content that requires individuals to submit personal information into a form in order to view the content. Is Facebook or LinkedIn Better for My Business? Are you trying to reach consumers? Facebook would be your go-to platform. Are you trying to reach other businesses or future employees? LinkedIn may be a better fit. Putting your time and energy into the platform that is the best fit for your target audience, goals, and industry is the most effective approach to social media for your company. This entry was posted in Facebook Marketing, Linkedin Advertising. Bookmark the permalink.